Skiing, sledding, snowshoeing, snowmen…winter adventures are great! Unlike the warmer months, winter adventures take a lot more gear, clothing, and planning. Getting kids dressed to go outside in the cold is exhausting (especially when they all have to pee the second they are fully dressed). Few things can make an adventure go bad as quickly as a cold kid. Before you know it, their complaining, whining, and screaming is going to make you head for hot chocolate as fast. as. you. can. 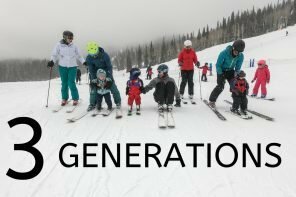 Obviously, kids get colder easier than adults do, however, the same principles that apply to keeping yourself warm can easily be transferred down to your tykes (even babies). Here are a few layering tips to keep in mind to keep your kids happy and warm. 1. Baselayers- Choosing a good quality baselayer is the most important step. If you choose a crappy one, you might as well give up before you start. 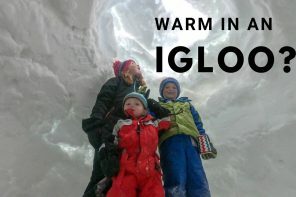 A baselayer is a layer that provides warmth and keeps kids dry – think long underwear. The best choices for one are made of wool, polypropylene, or microfleece – all of which wick moisture away. Wool is usually the most expensive (though longest lasting) with polypro and microfleece costing much less. The one thing that you want to avoid at all costs is cotton. When cotton gets wet (from sweat) it stays wet and will keep your kids cold. Yep, that means that waffle-weave cotton long-johns and basic PJ’s just aren’t gonna cut it! 2. Mid-layers – Midlayers are your main insulating layer. The easiest and cheapest, is fleece. Choose a fleece that is warm enough to really keep you toasty on a chilly day. A good way to know how warm a fleece is, is to feel how thick it is. A good rule of thumb with fleece is thicker = warmer. Down is also making a huge comeback, and with good reason – it’s extremely compact and super warm. If you’re going out on a really cold day (think 15 degrees or colder), a fleece and a down jacket is a great way to go. For babies and toddlers, get a one piece suit. For bigger kids, get a top AND pants. Do. Not. Forget. Warm. Pants. 3. Outerlayer – This layer should be waterproof and if possible, windproof. Think of this layer as your last defense against mother nature, so make it a good one. We learned the hard way that this a good piece of outerwear is worth spending money on. Yes, that means that a cool looking coat from Wal-Mart isn’t going to cut it. Buy a good brand that gets good reviews. For babies, and toddlers, a one piece suit with a hood is your best bet. For older kids, a combo is a great option. In a coat, I always look for one with a hood, drawcord at the waist, and a high neck. This can also double as a raincoat in the summer months. For pants, I’m a huge fan of bib-style snow pants since they do a much better job of keeping the snow out. Since outerwear can get really expensive, buy it 1 or 2 sizes too big and also plan on passing it down to all your kids. Make sure to have both a coat and snow pants! 4. Hat – Buy a good thick hat. Fleece and wool are the most widely available options so just choose your favorite (still avoid cotton). Again, thicker usually means warmer. One of the biggest things to look for in a hat is one that fits well and covers their ears. If you have a toddler or baby who likes to pull them off, get one that you can tie or velcro around the neck. 5. 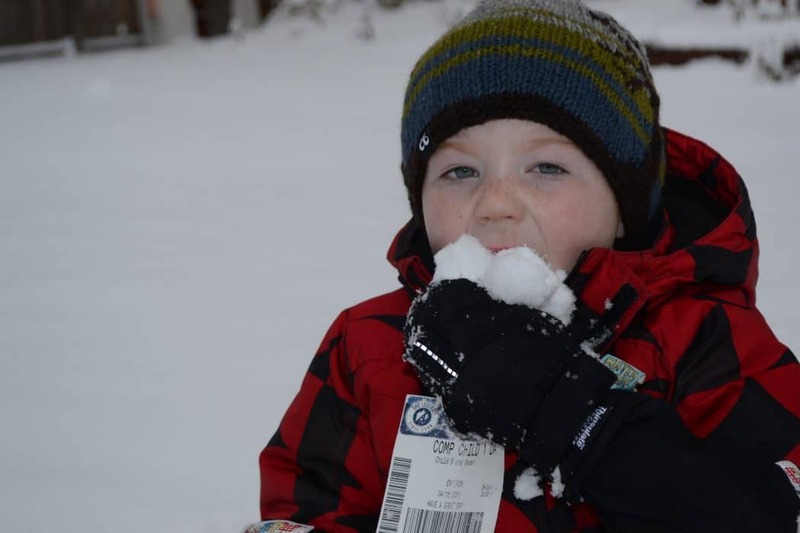 Gloves – One of my biggest pet peeves is parents who don’t put gloves on their kids in the snow. Obviously the kids are going to touch the snow and their hands will be instantly cold. I know it’s a pain, but make sure your kids have gloves on when they’re outside (that is, unless you like crying kids). 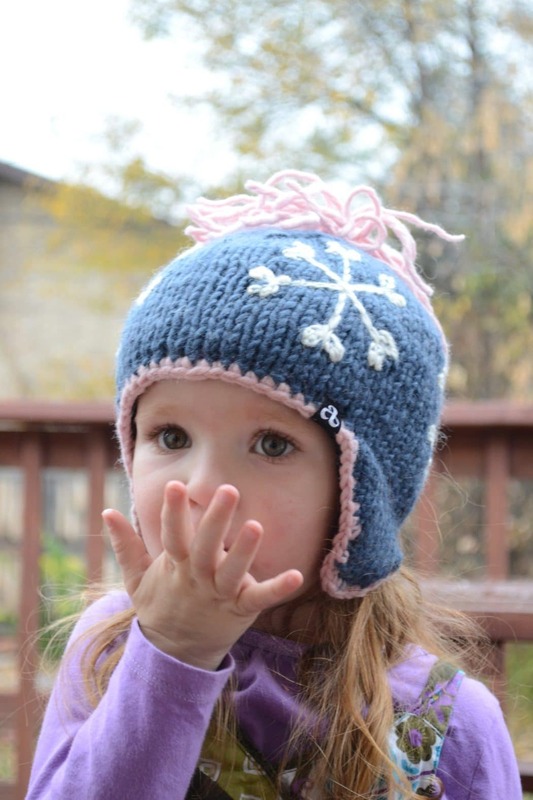 For kids, we prefer mittens (okay, I prefer them for me too) since they keep their hands warmer and are easier to get on. Our favorites are L-Bows since they are the best at staying on and eliminate the wrist gap (see our full review here). As with your outer layer, make sure that you get waterproof gloves. We re-apply waterproofing spray to all the kids gloves at the beginning of each winter. Babies can be tricky, so get in the habit of glove wearing as young as you can. Remember, NOT OPTIONAL! Think of them as baselayers for their feet. In fact, get a few pairs so you can double up on extra cold days. Also, I always buy my kids snowboots a few sizes too big. I want them to be waterproof (awesome for warmer days when there are puddles and snow piles) so I know I need to spend around $50 to get a good pair that will last through all my kids (though used clothing stores are a great place to find some). 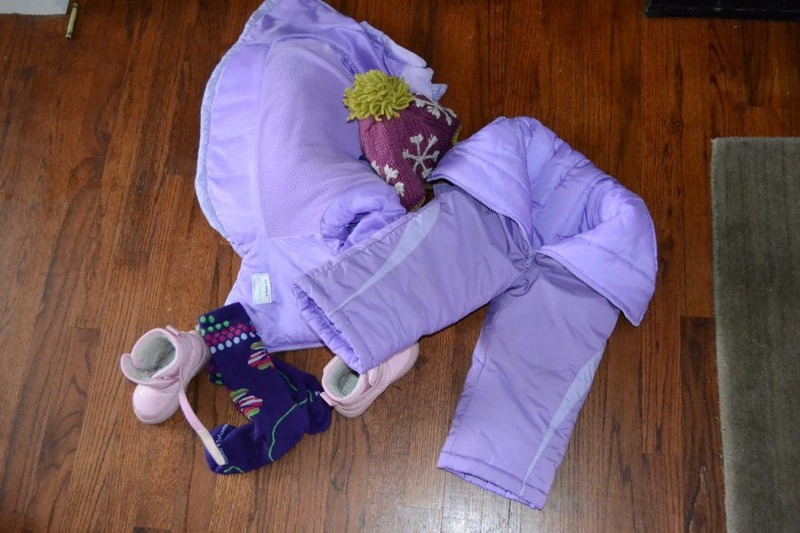 For babies, just put on a few layers of socks and a fleece or leather bootie on top. 7. 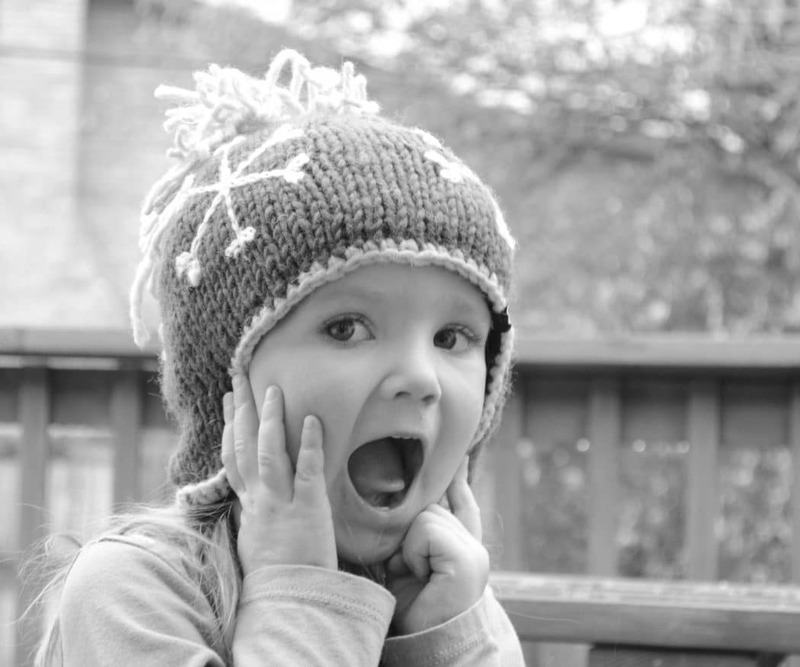 Face – When it’s windy or cold outside, keep your kids faces protected. We’re big fans of fleece neck gators and balaclavas. Check back in a few weeks for easy instructions on how to make them for only a few dollars. 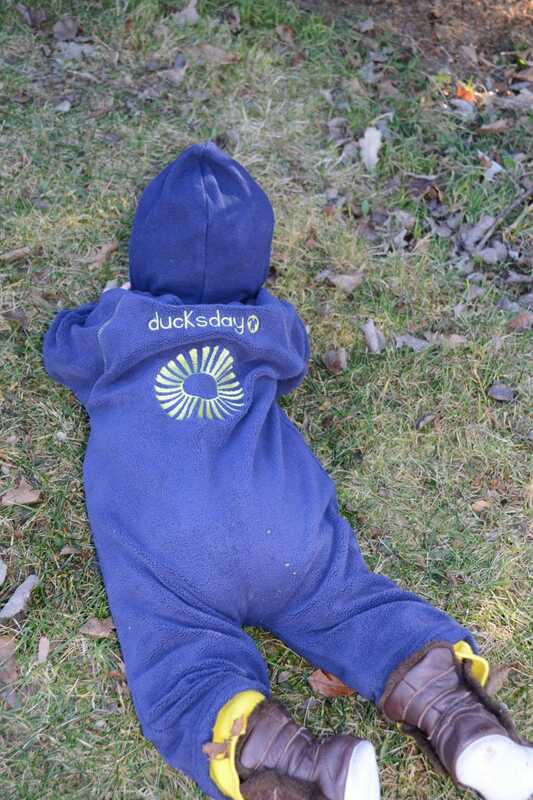 Ducksday Outerwear – For years, everyone has thought of outerwear for babies and kids as huge and bulky. It’s no wonder because that’s all that was available. The result is kids who can’t move since their gear is too big. Finally, someone came up with a better option – DUCKSDAY! They have taken the layering concept that most adults use and applied it to children’s gear. Ducksday has been around for years overseas and is making it’s debut in the US, this year! Fleece Jumpsuits – These fleece jumpsuits are great. A nice warm layer (though not hot) that is easy to put on and off. The full length zipper is fantastic and makes it the one fleece suit I’ve found that’s actually easy to get on Jimmy. I also like that it’s not too bulky so it’s great to wear in a car seat too. Simple, functional, and cute – what’s not to love! Rainsuit – This is the piece that sets Ducksday apart from everyone else. It’s a one piece waterproof suit, that’s the equivalent to a shell. In the summer it’s a rainsuit, and in the winter, it’s your waterproof outer layer. Genius! The suits start at a size 12 months and go all the way up to a size 5 and do a great job at keeping the whole body dry (as opposed to just a rain coat). 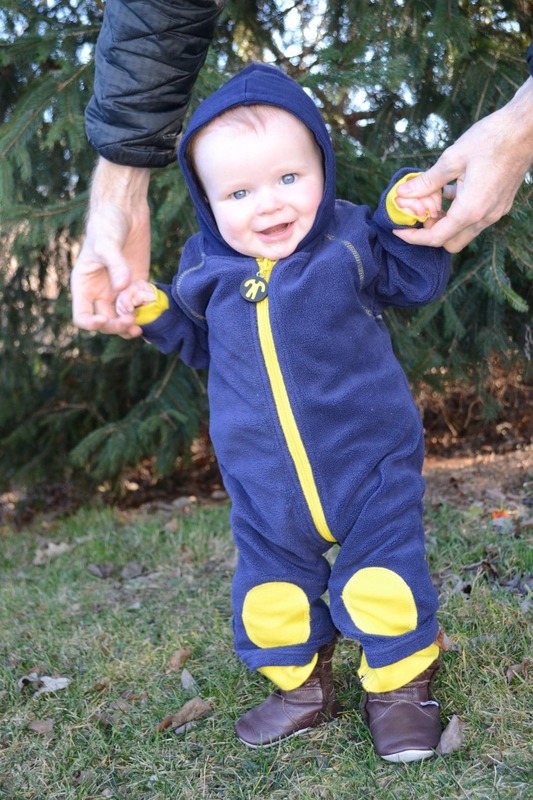 Jimmy (5 months) is wearing the 12 months size and is proof that this suit can easily be sized up without a problem. 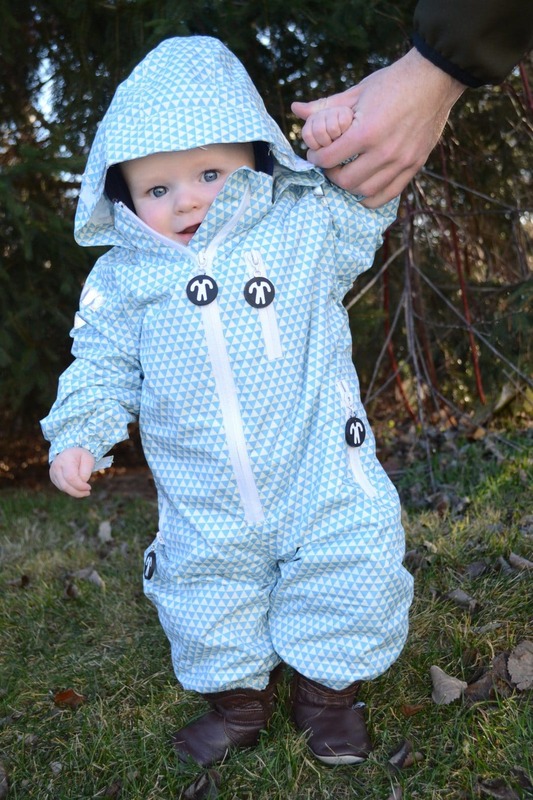 The cut of the rainsuit is nice and roomy to allow lots of room for layering. Remarkably, it’s not bulky AT ALL, so when you don’t have a lot of layers on, it’s nice and compact allowing kids to really move around. Oh, and speaking of moving, it has stirrups on the legs to keep it from riding up and having a gap for snow or water to get in the legs. It also meets my criteria of a hood, though since it just adjusts with velcro, the adjustabilty is limited. Nice and compact, it folds up into it’s own pouch down to about the size of a 1 liter bottle, making it easy to always take with you (as opposed to a gargantuan parka). Honestly, this is the best system I’ve seen for young kids and I’m surprised no one has made something like this sooner. Ambler Hats – Ambler never ceases to amaze me. Super warm hats. Amazingly cute designs. Empowering women in Nepal. What could be better? Really, this is our family’s favorite hat company all around. Now Jimmy’s joining in the fun in their Canuck model and having a toasty head like the rest of the family. Ummm, how can you not love this hat (and baby)? THe full coverage of this hat is awesome and it’s extra thick to keep him warm. Check out our review of more of their hats here. Nui Organics Footed Bodysuit – From the Nui site “Head to toe comfort. Wide cuffs at wrist fold forward and back to allow for growth. Ankle band keep little feet snug in the booties. Features natural shell buttons for easy access. In sizes for newborn to 12 months. Nui 100% organic Merino wool is soft and calming against the skin. 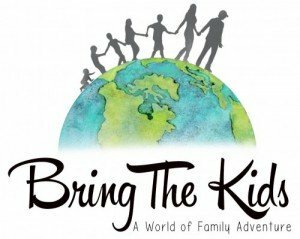 Silky smooth it does not itch and will act as an insulating layer, ensuring comfort and warmth.” Check back soon for Bring The Kids review – excited to find and test a merino wool suit for babies! One lucky winner is going to have a toasty little kid with a Ducksday rainsuit, Nui Organics footed bodysuit, and an Ambler Canuck hat! 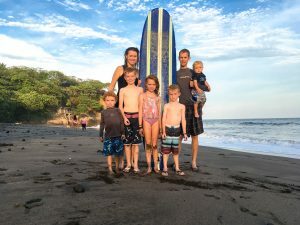 Thanks to Ducksday, Nui Organics, and Ambler for providing gear for this review. My favorite piece of outdoor clothing is my Mountain Hardwear Victorio jacket – waterproof and very breathable. However, I am super excited, I just a merino wool hat and mitten set for my son. My most used item for winter is gloves. I hate to have cold hands. Our little guy is 7 months old, we’re just learning how to dress him for the cold, but so far the most used piece of cold weather gear is his fleece suit. My favorite piece of outdoor gear is my coat…actually, I love my husbands coat more! I love his because it is too big but nice and warm so I feel like I am wrapped in a blanket when I wear it. My faves are my sorel boots – never have cold feet in even -20 degrees! My favorite piece of outdoor gear is my Patagonia Nano Puff. Super light, super compact, SUPER warm. Our fav. piece of outdoor clothing is the light puffy jacket, as warm as down, but oh so much less bulky. My son has the Northface Perito Jacket and my husband and I have ones from MEC. How big do those get? Up to 2T? Count me in if they do! My favorite outdoor gear is a good, lightweight but superwarm down coat. So it’s insulating but not too hot in warmer places. It’s knee-length too! Not too long to prevent free leg motion, but long enough to keep most of my legs good and warm out and about. Favorite? Fleece. Summer, fall, winter, spring. We use it always! P.S. We could use that suit cuz IT”S A BOY! My Skhoop skirt. 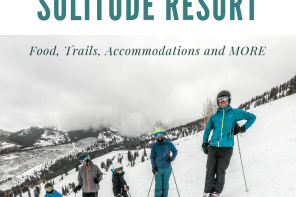 Sledding, skiing, shopping… anywhere! We probably use our fleece zip-down jackets the most – indoors, too. In the dark of winter, our merino wool socks become like hot chocolate – pure comfort on a cold day. I got an Ambler hat last year, and it is awesome. It’s good material, looks really nice, and most importantly it’s warm, I mean really warm. Any kid who got one would love it. My hat is my favorite. I’m not a big jacket person so on days that are a little cold I just put on my hat and am good to go. 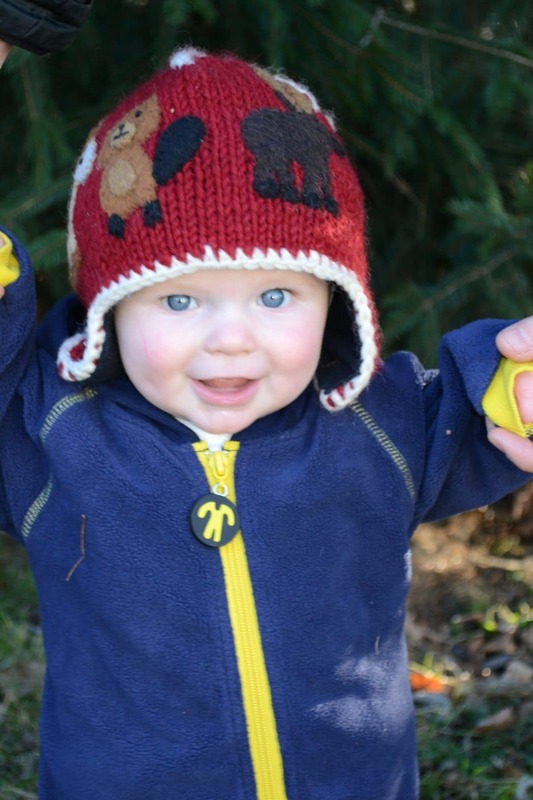 we LOVE our Patagonia PUff Ball jackets…and our DucKsday! I LOVE that canuck hat sooo much (and want to give the DucKsday suit to a friend who really needs it…) Thanks for the great chance! 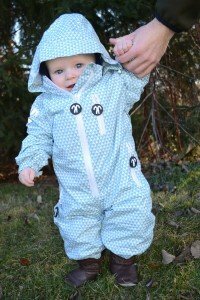 I absolutely required my REI rainsuit for my baby daughter last year.. but she just grew out of it and I need a replacement! She always gets frustrated when she gets wet while playing outside. I definitely need to get a all-weather waterproof layer like the Ducksday soon! Wool socks. My feet get cold really easily. I didn’t realize how bad cotton was, because my feet would stay warm… then sweat… then get cold again! With wool, my feet stay warm and dry. I wear wool socks every day in the winter. I have a fur lined cap that I love! My old brown Northern Reflections jacket that I bought on ebay used about 8 years ago. Such a great product. We live in cold wet Washington and would use the rain suit so often to go out and play! I’m with you on the mittens for adults! I found a pair on clearance a few years ago that are the warmest thing I own. I wish I could convince my 5-year-old that mittens were “cool.” He just won’t believe me. That would be my thick winter jacket and gloves is a must. I have a favorite vest that I wear hiking every time. What a great list of information! I remember when I first learned that cotton is not a good baselayer. Wow… what a shocker! Also, your baby jimmy is THE CUTEST EVER. I want our boys to play together! I have a favorite pair of hiking socks! I need to get more of them! Our nine month old will be staying warm in style. Love my wool Teko Socks they have lasted a long time not like other wool socks on the market. 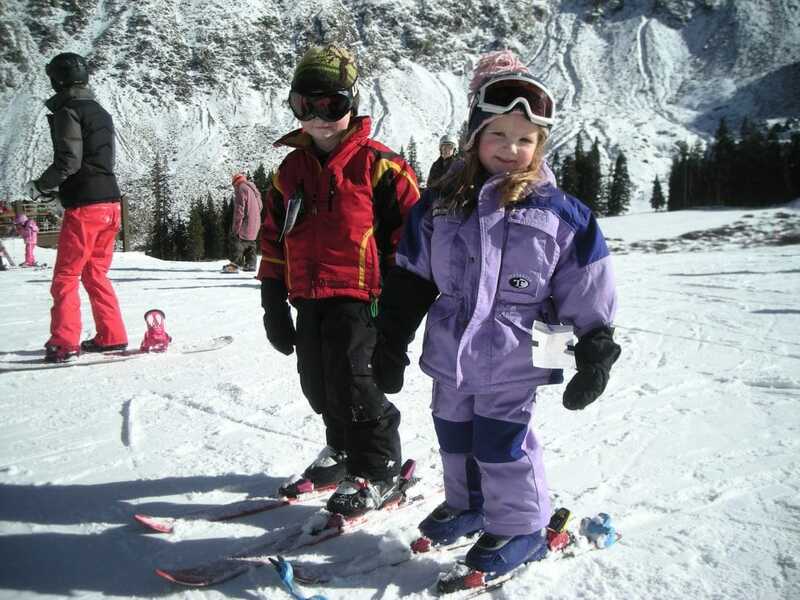 My favorite winter clothes is my skiing gloves and my snow boots!! I love my The North Face jacket. It’s probably similar their Redpoint Jacket. I have a used army field coat that has been my winter staple for almost 22 years now! I am pretty partial to scarves..and for my daughter – hats are a must! She’s 9 months old and barely a hair upon her sweet head.. I love my leather gloves with cashmere lining and long cuffs. They keep my hands nice and warm. i wish i would have had this kind of gear as a kid! My favorite would be my fleece jacket. My beanie! I always get cold ears if I don’t wear it in the cold. My hunter style hat. Keeps my ears super warm! My big wool hat, keeps my head super warm! thanks for the chance! Hiking boots! Don’t leave home without them! My warm gloves, I love them!!!! would have to be my gloves. My hands get really cold. My nice big coat that keeps me SO warm! a warm child is a happy child. and they look so dang cute looking like a puffer in those outfits! I love gloves to keep my fingers warm. Raincoat! We live in Oregon! I make hats, so my favorite piece of winter clothing just depends on what we are all wearing — we have hats to fit every occasion! Fleece one piece for my daughter! I have a wool lined, ear flap hat from L.L. Bean, that is NOT cute- but super warm! My most used winter item is my jacket. My favorite outdoor clothing item is my hiking shoes. My winter jacket and a pair of gloves! I LOVE a good pair of gloves. I don’t like cold fingers. SmartWool socks are a MUST at our house! My snow boots and carhart coat when i sled with my kids! I love my telemark boots. My skis have been known to sleep with me in bed. A good pair of running shoes is pretty hard to beat. my keen boots. they are amazing. Ice Bugs! it is snow covered and icy for 6 months and they help me get outside and retain my sanity. I had these awesome wool mittens that were super warmed, lined, and so cozy… until I washed them. They were the best. We use the hats all the time! my boots are toasty warm! I have a pair of gloves that I practically never leave the house without! They are so silky soft and warm and cute! In the winter my north face shell. I love my warm wooly gloves. I have a couple of different hoodies that i always wear. My 10 year old Lands End wool lined jacket! My homemade, fleece lined wool hat has been around for 10 years. Layers! Patagonia long johns for our toddler have worked great and I love one piece snowsuits. Definitely my waterproof jacket. But as a side note, thank you so much for this review! I had commented on another page that I could use some advice about finding warm gloves for kids… So I’m definitely going to check out the gloves you recommended in this post. Thank you! Our winter hats I made them. I’m not a fan of winter so I tend to stay away from winter clothes. My gloves..definitely. I am not one for hats or scarves but I must have gloves. My hiking boots are my favorite piece of gear. Hundreds of miles in them! They were the first “real” gear that my husband and I bought together. Both of us need to replace our pairs, but can’t find it in our hearts (or budget) to do it. My favorite are my boots. I know it’s not really clothing but since we ride our bikes EVERYWHERE, we use our helmets everyday. I think I attribute most of my warmth to my giant circle scarf!